Exploration activities in the Eureka Mining District began in the 1860’s when lead – silver ores were first discovered in the New York Canyon area. Exploration activities up to the 1970’s focused on finding additional lead-zinc-silver-gold ores being produced at Eureka, about 6 miles North of Lookout Mountain, but included two small drilling programs in the 1960’s by Newmont and Amselco Minerals at Rocky Canyon looking for porphyry Molybdenum mineralization. Discovery of several small lead-silver-gold mines in what was known as the Secret Canyon District (South Eureka District), about 1.5 miles East of Lookout Mountain/Ratto Ridge, occurred early in this time period. 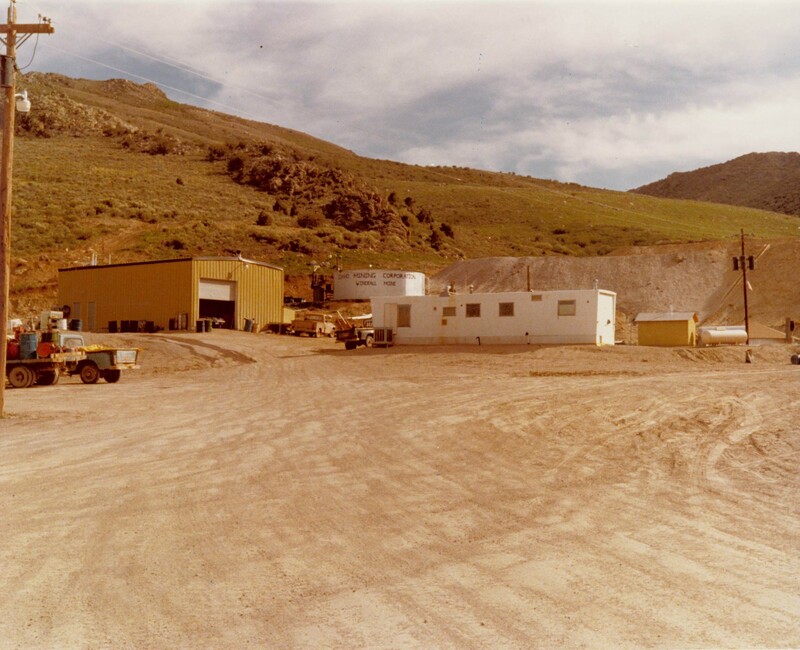 Windfall by Idaho Mining Company (Windfall group) in the 1960’s and 1970’s brought modern day prospectors into the area and led to the discoveries of Nevada’s first heap leach gold mine at Windfall in 1975. Since Idaho Mining (Windfall group), several companies have explored the Eureka District, leading to a series of discoveries including Homestake Mining Company’s Archimedes mine (Ruby Hill – Now Barrick Gold), and Amselco’s discovery of gold mineralization at Lookout Mountain. Modern exploration efforts (including geochemical sampling, geophysical surveys, and drilling) on the South Eureka property span a period of over thirty years, and has led to the delineation of two separate roughly North-South oriented mineralized structural trends; the Windfall trend, and the Lookout Mountain/Ratto Ridge trend. Historic drilling programs were conducted concurrent with and guided by extensive geologic mapping, geochemical rock and soil sampling programs, and air and ground geophysics. Geological mapping and geochemical programs were very successful in discovering target areas characterized by permissive structures and anomalous concentrations of gold with arsenic, antimony, and mercury toxic element geochemical anomalies in soil and rock samples. The importance of a geochemical-geological exploration approach is evidenced by the fact that the drilling of many such anomalies has resulted in significant indications of disseminated gold mineralization. The Windfall, Rustler, and Paroni deposits on the Windfall trend and the Lookout Mountain deposit on the Lookout Mountain/Ratto Ridge trend were discovered by drilling soil and rock anomalies in permissive structural and stratigraphic settings. Drill testing of several geochemical anomalies in permissive geological settings has also resulted in the discovery of several promising zones of gold mineralization on the Hoosac, Windfall, and Lookout Mountain claim groups that have yet to be fully tested. Drilling along the Windfall trend; at the Windfall Mine, Hoosac Mountain and Hamburg Ridge include efforts by the Windfall group (63 holes, 1970s-1980s, and production from 1975-1984), Amselco (8 holes, mid-1980s), Norse-Windfall Mines (Production and 63 holes, 1986-1988),Tenneco (18 holes, 1989-1991), Pathfinder (18 holes, 1993) and Cambior (27 holes, 1995-1997). On the Windfall, Hoosac, and New York Canyon claim groups, Bill Wilson of the Idaho Mining Corp, then Windfall Venture, initiated reconnaissance mapping, soil and rock chip sampling, trenching, and drilling in the early 1970s. He noted that the original underground Windfall Mine, which was discovered in 1908 and produced approximately 65,000 tons of ‘invisible gold’ mineralized rock grading 0.368 oz/ton, was a Carlin-type sediment-hosted disseminated gold occurrence. Wilson’s work emphasized the east side of Hamburg Ridge, the Windfall Trend, where he drilled, with conventional air rotary, holes F1 through F20, and Z-1 through Z-31, Z42, and ZA-1 on the current Windfall group. He drilled holes Z32-41 on the Hoosac group. The drill holes were generally from 50 to 250 feet deep. Six of Wilson’s original forty-three Z-holes intersected gold mineralization exceeding 0.02 oz of gold/ton. This success led to infill drilling and the development of the Windfall open pit mine in 1975, and soon thereafter, the Rustler and Paroni open pit mines. 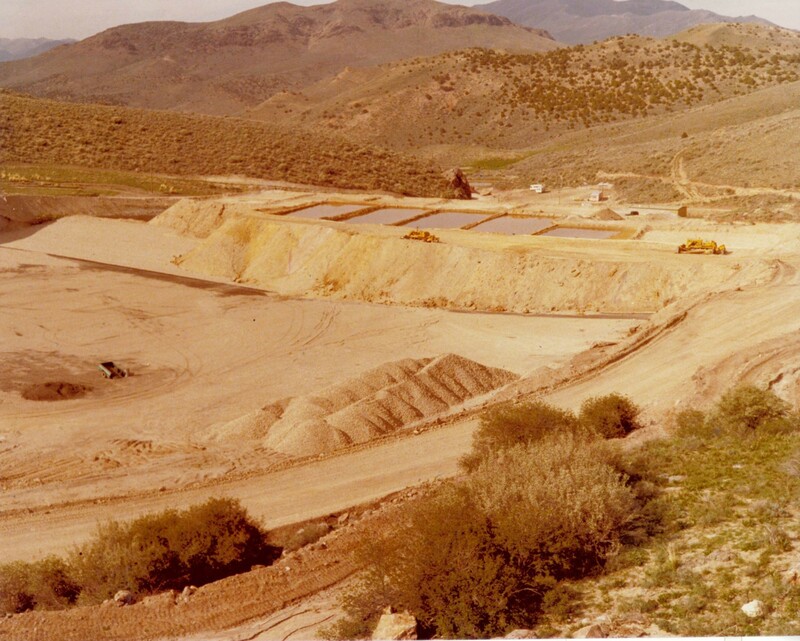 Gold was extracted in Nevada’s first CN heap-leach operation from sanded and silicified dolomite and silicified shale. Windfall Ventures operated these mines continuously up to 1984. The Windfall Venture group sold an interest in the property to a consortium of three companies – Viking Financial, Norse Mines, and Campbell, Foss, and Buchanan – which formed Norse-Windfall Mines. Norse mined the Windfall, Rustler, Paroni, and Lookout Mountain deposits from 1986 to 1988, and conducted exploration which included several drill campaigns and the delineation of additional resources on the Windfall trend. The group also drilled several holes at Lookout Mountain and took numerous rock chip samples over the entire length of Ratto Ridge. The last significant exploration program to look at the Windfall trend was that of Pathfinder Exploration from 1993 to 1995 and then a Joint Venture between Pathfinder and Cambior Exploration from 1995 to 1997. These programs completed geologic mapping, soil and rock geochemical sampling, and ground magnetic surveys along with 45 drill holes. The exploration efforts helped identify a continuous zone of surface and drill indicated gold mineralization with a total strike length of over 4 miles. In doing so the company took over 450 rock samples, over 1900 soil samples, and drilled 45 holes along the entire length of Hamburg Ridge. On the Lookout Mountain/Ratto Ridge trend, drilling programs began with Amselco (296 holes, 1978-1985) followed by Norse Windfall Mines (20 holes, 1986), EFL Gold Company (10 holes, 1990), Barrick (40 holes, 1992-93), and Echo Bay (104 holes, 1994-98). Amselco Exploration began exploring the Lookout Mountain project in 1978, after acquiring the property from the Bisoni brothers who staked the original RAT claims in 1974. Amselco conducted an extensive geologic mapping program, soil and rock sampling surveys, and an initial 15-hole reverse circulation drilling program at South Adit area of Ratto Ridge. The program tested gold mineralization and associated geochemical anomalies, and jasperoid development along the N-S trending Ratto Ridge fault zone. This first drilling campaign discovered significant sediment-hosted disseminated gold mineralization. Between 1978 and 1985 Amselco drilled a total of 296 holes along a 3.5 mile stretch of jasperoid capping Ratto Ridge. Amselco discovered five other areas along Ratto Ridge during this time span which contain partially developed gold resources. These areas are located at South Lookout Mountain, Pinnacle Peak, Triple Junction, South Ratto Ridge, and South Adit. In 1986, while Amselco was in process of becoming BP Minerals, Amselco management decided that the Lookout Mountain deposit was not of further interest and the property was optioned to a joint venture of three companies which then owned Norse-Windfall Mines, the Eureka Venture. Eureka Venture continued work at Lookout Mountain in 1986 through 1988. The group drilled 11 exploration holes, and calculated a non-compliant resource of 446,246 in place tons with an average grade of 0.12 oz of gold/ton. Eureka Venture was disbanded in 1988 and the property was turned over to EFL Financial which formed EFL Gold Mines, then Summit Minerals. The Company ran small programs to cover assessment costs. In 1990, EFL Gold Mines took bulk samples from the floor of the Lookout Mountain pit. These samples returned assays values ranging from 0.10 to 0.135 oz of gold/ton. EFL also drilled 9 holes, two of which drilled 500 feet (152 meters) into the floor of the pit, intersecting significant oxide gold mineralization beneath the pit floor. Barrick (1992-93) acquired the property in 1992 and over the next two years completed geologic mapping, took more than 500 soil samples to expand and fill in Amselco’s soil grid, collected over 200 rock samples, and drilled 40 holes throughout the property. Drilling targeted favorable stratigraphy at depth near fault intersections. Barrick discovered that surface geochemical anomalies are apparently controlled by E-NE and N-NW to NW trending cross structures which intersect the N-S trending Ratto Ridge Fault. Much of the Barrick work focused on the deeper potential in Cambrian Dunderberg Shale East of the Ratto Ridge Fault, but also drilled several holes to test potential in the Devonian Nevada Group west of the fault. Outcrops of Nevada group carbonates along Ratto Ridge show weak gold mineralization, strong alteration, and anomalous pathfinder element geochemistry. It should be noted that the potential for mineralization west of the Ratto Ridge crest has not been explored adequately. Barrick drilled 40 holes to an average depth of 850 feet, with several holes intersecting gold mineralization. However, Barrick’s surface work, and the additional drilling in areas of known mineralization previously discovered by Amselco found insufficient mineralization to meet corporate objectives. holes on the Ratto Ridge trend. Most of these 29 holes were drilled in the area South of the Lookout Mountain Pit down to South Lookout Mountain, exploring the Cambrian Dunderberg Shale – Hamburg Dolomite contact, and testing Devonian Nevada Group targets west of the Ratto Ridge Fault. 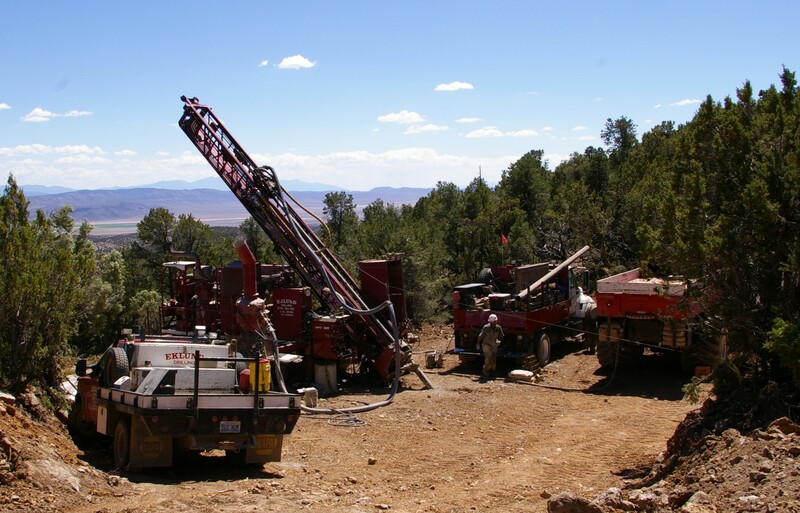 Several promising holes, including drill hole EBR-27 which intersected 110 feet grading 0.031 oz of gold/ton in the Dunderberg Shale, and drill hole EBR-9 which intersected 240 feet grading 0.043 oz of gold/ton in the Nevada Group were drilled in this campaign. Work from 1996 to 1998 saw a change in focus toward the Rocky Canyon area where favorable surface sample anomalies and mapping generated new targets for drill testing. Following up on initial drill successes in 1995, Echo Bay put 71 additional holes into the Rocky Canyon area which led to the discovery of a small resource. In the year 2000, Alta Gold estimated a 35,000 ounce non compliant historic gold resource based on Echo bay’s drilling. Eventually, the Echo Bay project totaled 104 RC holes. Faced with depletion of budgets and no significant exploration success, the decline in gold prices, and large land payments, Echo Bay decided to drop the property at the end of 1998. Century Gold LLC acquired the Property in 2003 and through a purchase of assets the property was transferred to Staccato Gold in 2004. Staccato re-negotiated the mining lease with Rocky Canyon Mining Co., the owner of the Lookout Mountain Claim Block and from 2005 to 2007, drilled 25 core holes in the Lookout Mountain area searching for high grade mineralization first encountered by Amselco in 1985. Staccato’s early program led to the delineation of a small, but high grade sulfide ore body beneath the Lookout Mountain Pit. Staccato drilled 25 holes, including seven core holes for stratigraphic and structural purposes, in 2008 along the southern end of Ratto Ridge and in Rocky Canyon. Four additional holes were also completed beneath the Rustler pit on the Windfall trend, with one hole, BHWF-004, returning 75 feet at 0.153 ounce per ton gold (22.9m @ 5.25 g/t Au). Late in 2008, Staccato initiated the process for an exploration Plan of Operations Permit. While waiting on approval for the Plan of Operations, Staccato began a district wide detailed mapping and geochemical sampling program in 2009 to further refine work completed by Barrick and Echo bay on Ratto Ridge, and define additional exploration targets elsewhere in the district. Staccato also mandated a new resource estimate for Lookout Mountain which required a full geologic model. Re-logging over 400 historic drill holes and completing a cross sectional geology model of Ratto Ridge ensued. Exploration drilling was also carried out on the Windfall trend to follow up on intercepts drilled in 2008 below the Rustler Pit. Ten holes, including 4 step out holes from 2008 hole BHWF-004, were drilled in 2009. Several of these holes intersected low grade oxide mineralization up to 600 feet below pit bottom. Staccato completed the necessary baseline work for a resource estimate and a complete sectional model for 4500 feet of strike length covering both Lookout Mountain and South Lookout Mountain in early 2010. In March of 2010 Timberline announced a merger agreement with Staccato Gold. Timberline decided to maintain Staccato’s detailed mapping and sampling programs for target generation on the Windfall trend and Ratto Ridge, and the exploration approach of the program in Rocky Canyon and Secret Canyon, but decided to complete an initial infill drill program at Lookout Mountain. Based on this decision, staff at South Eureka developed a drill program around the completed sectional model to be implemented once approval for the Plan of Operations was received. Approval was granted in August of 2010.